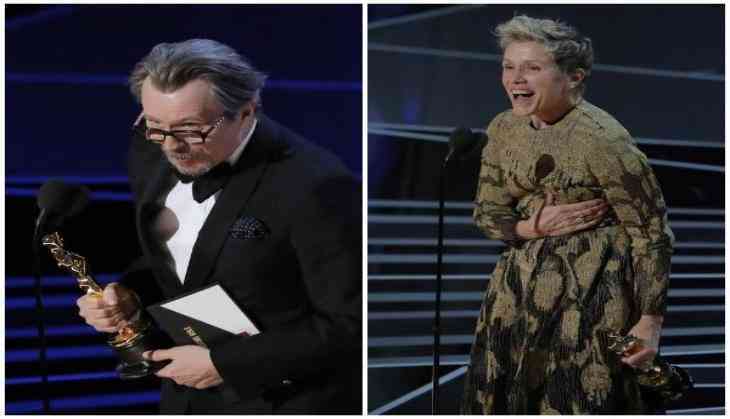 After doing all the hard work for more than 35 years in Hollywood, Gary Oldman has finally grabbed the much-deserved 'Best Actor' trophy at the 90th annual Academy Awards. The actor won the Academy Award for his portrayal of Winston Churchill in Joe Wright's 'The Darkest Hour'. He beat out fellow nominees Daniel Kaluuya ('Get Out'), Daniel Day-Lewis ('Phantom Thread'), Denzel Washington ('Roman J. Israel, Esq'. ), and Timothee Chalamet ('Call Me by Your Name'). Oldman started his speech by saying, "My deepest thanks to the Academy and its members for this glorious prize. I've lived in America for the longest time and I'm deeply grateful to her for the loves and the friendships I have made and the many wonderful gifts it has given me: my home, my livelihood, my family, and now Oscar." In the film, Oldman portrays U.K. Prime Minister Winston Churchill in the early days of World War II. He praised Churchill as he accepted his award, saying, "I would just like to salute Sir Winston Churchill who has been a marvelous company on what can be described as an incredible journey." The 'Tinker Tailor Soldier Spy' star concluded by thanking his mother, "who is older than the Oscar, she is 99 years young, next birthday. And she's watching the ceremony from the comfort of her sofa. I say to my mother, thank you for your love and support. Put the kettle on. I'm bringing an Oscar home." Meanwhile, Frances McDormand">Frances McDormand won her second Academy Award for her role in 'Three Billboards Outside Ebbing, Missouri'. The actress beat out Sally Hawkins ('The Shape of Water'), Margot Robbie ('I, Tonya'), Saoirse Ronan ('Lady Bird') and Meryl Streep ('The Post'). McDormand was quick to joke when first beginning her acceptance speech and said,"So I'm hyperventilating a little bit." After thanking her loved ones, the actress explained that she wanted to gain perspective, as she then powerfully acknowledged the female nominees in the arena, asking each of them to stand with her. She went on to thank her husband, Joel Coen, and their son Pedro, before placing her statuette on the floor and saying, "And now I want to get some perspective. If I may be so honored to have all the female nominees in all the categories stand with me tonight." As her fellow nominees stood, McDormand said, "We all have stories to tell and projects we need financed." The actress' last words made reference to the belief that there should be requirements in contracts that provide for gender and racial diversity. She took her first in 1997 for leading the cast of the 1996 'Fargo'.